Key City: Shibata is another example of a city that prospered and grew around a castle. The castle was founded in the 1590’s by Mizoguchi Hidekatsu, but it wasn’t completed until the mid 1600’s by his great-grandson. At the height of its power, the castle was made up of 11 keeps and 5 gatehouses. By all accounts it was a sight to behold. remaining gatehouse, but visitors aren’t allowed to cross the moat. At that time, one of the greatest threats to large structures was fire. They didn’t have access to reliable fire-prevention methods or fire extinguishers, so if a wooden building caught fire, it had to be dealt with quickly or the building was surely lost. Imagine constructing a castle complex like Shibata all made of wood. You’d be worried too! If you look at the top of the castle in these pictures, you’ll notice there are three points sticking up on the roof. If you look really close, you’ll see that they are three fish-like creatures, called Shachihoko (or Shachi for short). A literal translation would be something like “killer whale.” They have faces like lions with long teeth and the bodies of big fish. Weird decoration, you think? common practice of his day by placing these figures on the roof of his castle in the hope that this god would protect him from fire. In fact, Shibata Castle is the only one known to have three Shachi per roof instead of two. He really wanted to protect his life’s work. Not to be too heavy-handed with this, but can’t you see the spiritual lessons to this story? If only there had been someone to say, “Let me introduce you to the God who can protect you from fire for all eternity!” Will you pray for Shibata, a city with over 100,000 people destined for a fiery eternity? I don’t even know where to start with today’s Key City: Sanjo. My editor might have to rein me in if I get too wordy! 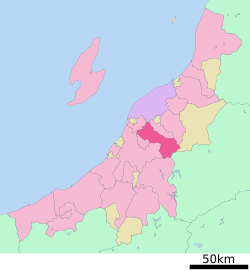 Sanjo is long and relatively skinny, running east to west and is basically cut in half by the Ikarashi River, which forms a “T” with Japan’s most famous river Shinano on the city’s western border. These great rivers help make the land very fertile, and farming has been the way of life for the people for millennia. To the east are dense forests and snow-capped mountains, lending the area great beauty. citizens survive the destructive flood season each year. He paid for blacksmiths from Edo (modern Tokyo) to come and teach his farmers how to make nails while their farmlands were underwater. Today, you can visit the Sanjo Blacksmith Dojo, which still trains its students to work metal in a traditional way. Tourists can even take classes on building a fire, quenching, forging, grinding and sharpening. Seibei Ootani knew his people could not survive as things were going, and that sentiment is still true in Sanjo. The people there do not know the Gospel, and they cannot survive as they are. They need the Savior! Pray for us that we can plant churches that will still be training men to preach the Gospel after 400 years of saving lives! Several of the cities we talk about on this blog grew up around forts or castles, and Key City: Mihara is no different. When construction began on Mihara Castle, the population immediately began to multiply. People flocked there for many reasons, not least of which was safety from the wars ravaging Japan at the time. In 1567 when the castle was completed, the citizens took to the streets dancing in celebration. That celebration is still remembered in a festival called Yassa Matsuri. The young and old gather in the streets, dressed in brightly colored, traditional happy coats. Local businesses shut down, sending their workforces into the parade of dancers. For over 400 years, that first celebration has been reenacted each year. I wonder why. The castle itself is in ruins. Only three of its original buildings still stand, and the rest of the complex is dilapidated and unrecognizable. The grounds serve no purpose, other than that railroad tracks were built on the foundation. Why would they still celebrate something that has come to such ruin? Because they remember their history. Their city could never have survived without that castle. The people would have been killed in war or starved in poverty. They owe their existence to that castle, and they know it! I think back to the church I grew up in. It’s not the same as it was. Many of the people I loved are gone. The buildings have changed over the years. But when anyone asks me about it, I only have the highest praise… because I know that I owe my existence to that church. Just like Emperors in old Japan used castles to influence and interact with their people, God uses his church to reach and change us. Mihara has an old castle. Most sizable Japanese cities do, but what they need now are some churches!